Your plants may be small now, but they’re mighty – and soon they’ll be mighty tall. 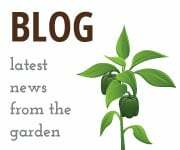 Plants need support for healthy growth and to avoid damage to overtaxed stems. Good support also can help maximize your use of limited space. When planning your garden, consider how and where the plants will grow so you can space them appropriately and provide room for support before they need it. 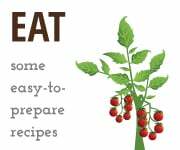 Common vegetable garden plants that require support are tomatoes, peppers, eggplants – anything with large, heavy fruits and vining habits – and climbing crops such as peas and beans. Other plants, such as zucchini, can benefit from a little containment to keep them out of their neighboring plants’ way. And still other plants, such as cucumbers and melons, can be trained to grow vertically to save space. Determinate tomato varieties generally grow in a bush form and require little more than a cage to keep them upright, but indeterminate varieties will grow and fruit right up until frost. 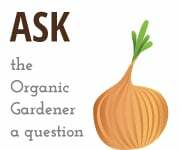 At a minimum, a sturdy wooden or metal stake pushed deep into the ground next to the plant’s main stem and attached to the stem with garden twine, tape, or clips will help support the plant and help prevent it from falling over. But because tomatoes fruit all the way down the branches, some horizontal support for the branches is a good idea to keep the fruit from sitting in the soil and rotting. The simplest way to support an indeterminate tomato is with a tomato cage – a series of stacked wire rings attached by vertical supports. Very basic round galvanized tomato cages can be found at big-box stores for $2-$3 each, but a really robust tomato plant will rapidly outgrow these. Square and triangular cages and tomato ladders are other options. 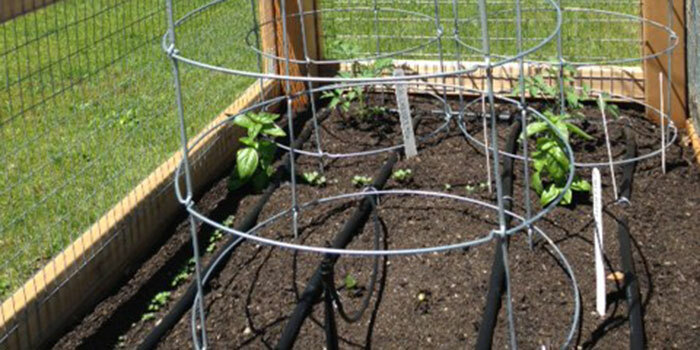 In our garden, we used Texas Tomato Cages, which are collapsible, reusable, and – importantly for tomatoes – extendable. As the tomato grows, cages can be added to the top of the existing cage to extend support as high as the vine needs it. It’s best to install whatever support you’re using at the same time you plant your seedling; adding support later can result in damage to the roots. Center the plant’s main stem inside the cage and push down firmly. As the tomato grows, you can loosely tie the branches with twine or tape to the horizontal supports to keep the fruit off the ground. Smaller plants like bell peppers and eggplants can also benefit from support, though it need not be as elaborate or heavy-duty as tomatoes. A simple galvanized cage works well to help contain the plant and let it rest its branches; a sturdy stake with the main stem tied to it also does the job. With a stake, be sure to add ties to the stake as the plant grows. Big, bushy plants like zucchini don’t generally need support, but can be contained a little by centering it inside a galvanized cage. Peas and pole beans are classic garden vegetables and can be grown in very little space if they’re given enough vertical room to grow. Freestanding trellises or cages are great for vining plants – or you can even sow seed next to a chain link fence and let them grow up the fence. Cucumbers, pickles, and even melons can easily be trained to grow vertically with a little forethought. A-frame trellises can be purchased or built and allow space under the trellis to grow plants such as spinach that benefit from a little shade in the hottest days of summer. I planted my tomato but didn’t add any support – and now it’s really big. Is it too late? It’s never too late! A good after-the-fact technique is surrounding the plant with three or four 8-foot-long bamboo stakes set deeply into the ground, and then tying the stakes together at the top to form a cage to which you can then tie branches. Be careful when pushing the stakes into the ground – if you feel sudden resistance, stop pushing – you’re probably hitting a root – and move the stake over a bit and try again. Can I grow melons on a trellis? Yes, but they’ll need a little help from a sling – use a piece of old t-shirt to rest the melon in, and tie the sling to the trellis or fence.